"Naki'o, a Red Heeler cattle dog, was abandoned in a frozen puddle and suffered such severe frostbite that he was left with just stumps to move about on. His future was looking grim until veterinary surgeon Christie Tomlinson, who was looking for a playmate for her golden retriever, saw him at a Colorado rescue centre. [...] as he grew and gained weight it became painful for him to walk, especially on hard surfaces. Eventually Naki'o had to crawl along on his tummy at home and at the clinic's daycare centre. Then Christie heard about a company called Orthopets in Denver, Colorado. 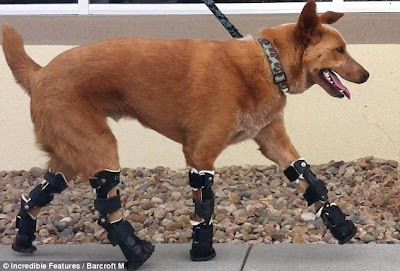 Founded by husband and wife team Martin and Amy Kaufmann, Orthopets began when Martin saw that his experience in creating human orthotic devices could be adapted for animals. [...] 'I thought we should be using the technology used for humans on our pets. 'An animal is a much better patient than a human. They have drive, determination and they just won't quit. 'They don't feel sorry for themselves.' Since undergoing the pioneering surgery Naki'o can leap and bound with the best of them." Are we doing 3D Maps yet? "The Vanishing Textiles of Africa"
Hubway ~ Metro Boston's Upcoming Bikeshare! Solar Sinter ~ 3D Printing Using Sunlight & Sand! Realistic Tube Map? ~ Mapping Under London! High Tech History ~ Key Innovation Archive! TEDxBoston ~ Live Delights & Insights NOW! Ultra-Pano Displays ~ Future of VR Immersion! Brazilian Talent Dynamics ~ Boomtime Demand! Golden Chemistry ~ Great Book from my Youth! Inventing Apple ~ Wozniak Recollects DIY PCs! Chemical Reactions ~ Patten Exhibit Wins MUSE! Good Vibrations ~ Cool FLUKE Slo-Mo Promo! Greentown Labs ~ Boston Boomzone Incubator! Überbars ~ Coolest Rooftop Brews w/ Views! Driving Change ~ Saudi Women, Quiet Rebels? Buses of Bogotá ~ TransMilenio Urban Solutions! Build Change ~ More Quake Resistant Housing! EurekaFest 2011 ~ Celebrating Invention+Action! 2MASS ~ 3D Map of 50K Galaxies in Local Uni! OV-Fiets ~ Dutch Bikeshare Rentals Booming! Anti-Gravity Dancing ~ Windtube Choreography! Vintage Monrovia ~ Inspiring Historical Imagery! SWITL ~ Wow, Semi-Liquid Picker-Upper! Tankbot ~ Guan's Land-Bear-Shark Treadboard! MIT 150 ~ Finale Celebration Super Salute! Dutch Intolerance ~ Foreigner "Coffeeshop" Ban?! Solar Blast ~ NASA/SDO's Helioviewer Video! Living His Dream ~ MIT's Srikanth Bolla! ACROS Greenscraper ~ Inhabitat Photoessay! How's the T? ~ MBTA Subway Status Updates! ASEAN Sourcing ~ Supply Chains "Beyond China"
Energy Map ~ Delivering Key Power to People! Echoing Green Fellows ~ Saluting the 2011's! Commencing! ~ MIT Granting 2,500 Degrees!